Kabul - An Mi-8 helicopter crash took place in the northern of Afghanistan, resulting in 12 people killed including one foreigner. According to Afghan News Agency and Officials, the helicopter was carrying 14 people including 12 Afghan security personnel and 2 Ukrainian crew members. The helicopter was owned by Moldovan company. It is also said that the aircraft was operated by Moldovan International Cargo personnel. 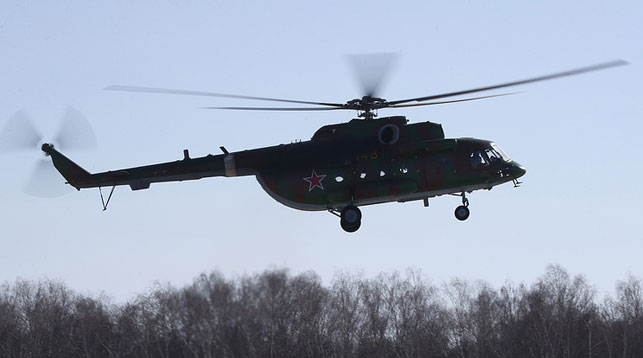 According to Moldova’s aviation authority, The Mi-8 helicopter crashed on September 2 after takeoff from a military base near Mazar-e Sharif, the capital of Balkh Province of Afghanistan. The deputy commander of Afghan forces in northern Afghanistan has said that The helicopter crashed Dehdadi district due to some 'Technical failure'. Afghanistan has been fighting the ongoing war on terror with the help of Western powers against Taliban/ISIS since after the invasion of United States into Afghanistan. Thousands of Afghan Security personnel have been either killed by militants or in accidents like this. The future of Afghanistan is on stake as militants are holding more than 60 Percent of total territory of country while ISIL is also settling in Afghanistan.